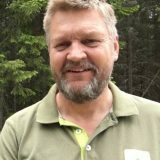 Forestry.com has previously presented statistics from the Swedish forwarder market. 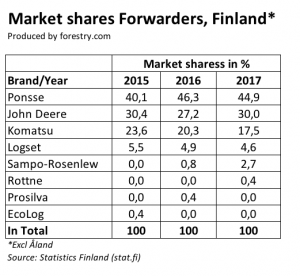 Now, we have also gotten hold of registration statistics from the Finnish forest machinery market, and it’s a highly interesting read. It’s especially interesting when comparing the results to the Swedish market. 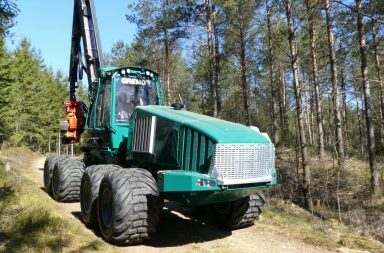 There are loads of similarities between Swedish and Finnish forestry, but when it comes to the machine market, there are vast differences. In the Finnish statistics harvesters are included, and it’s interesting to see how many harvesters are sold compared to forwarders. This is something we don’t know about the Swedish market. More on this further down. If you compare the forwarder markets of Finland and Sweden, the Swedish sales are 20-25% higher in terms of the number of machines sold. 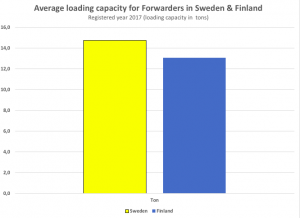 If you also take into account that, on average, forwarders sold in Sweden have a 13% greater load capacity, the total hauling capacity of the Swedish market is significantly higher. At the bottom of this text, I have listed a few questions that would be quite interesting to discuss, regarding the differences between Sweden and Finland. One of the most obvious differences is how the market shares are divided between various manufacturers. In Sweden, it’s a close call between John Deere and Komatsu, with John Deere being the market leader in forwarders in 2017. Ponsse and Rottne are competing for third place. In Finland, on the other hand, Ponsse is dominating completely. They have around 49% of the harvester market and 45% of the forwarder market. 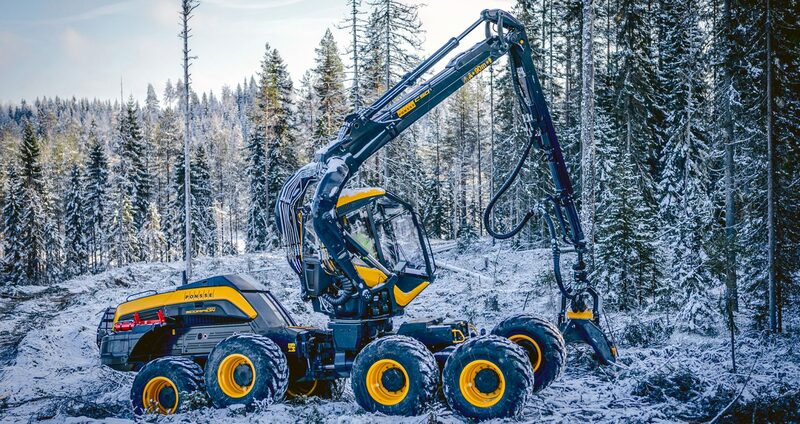 Ponsse sells almost as many machines in Finland as John Deere and Komatsu combined. In Sweden, John Deere and Komatsu combined are selling five times as many forwarders as Ponsse. 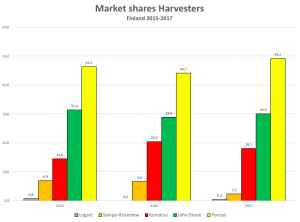 In Finland, Ponsse and John Deere are quite stable in market shares (see the tables for forwarders and harvesters) over the last three years, and the same is true for Komatsu on the harvester market. Komatsu is clearly losing ground on the forwarder market, however. From a market share of 24% to 18% during 2015-2017. Hopeless market for the smaller manufacturers? Another significant difference is that the three major manufacturers are dominating the market completely in Finland. The space for the smaller manufacturers is quite small. In terms of harvesters, the three major manufacturers had a whopping 97% of the market last year. For forwarders, 92%. The corresponding number on the Swedish market is 80%. 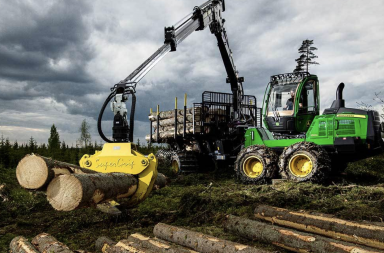 Logset is still number four on the forwarder market in Finland but is losing ground. Sampo-Rosenlew has started selling their forwarder in Finland and seem to be gaining traction. The Sampo harvester, on the other hand, seems to be losing ground in Finland. Both EcoLog and Rottne are aiming to sell machines on the Finnish market. Gremo, on the other hand, has chosen not to go there. According to the registration statistics, you can’t say that Gremo are missing out. At least not yet. EcoLog sold one forwarder in 2015 and Rottne sold one in 2017. A tough situation for Swedish machines in Finland! But that might be the same phenomenon that Possne has been battling in Sweden? Or what do you think? It’s interesting to see the relation between the number of harvesters registered compared to the number of forwarders. In Sweden, there’s an understanding among manufacturers that there are more forwarders sold than harvesters. 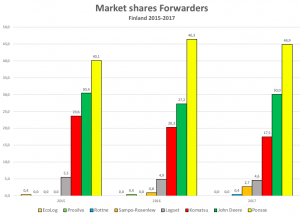 In Finland, the relation seems to be 1:1 – as many forwarders as harvesters, with some variation from year to year. The market shares between the different manufacturers is also only marginally different when comparing harvesters and forwarders. 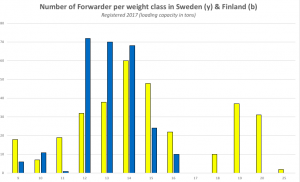 A clear and quite large difference between the forwarder market in Sweden and that of Finland is that very few forwarders of the smallest sizes are sold in Finland, and none of the largest ones. Almost all forwarders registered have a loading capacity between 12 to 15 tons. In Sweden, significantly more forwarders with loading capacities around 10 tons are registered. These machines are sold only in Southern Sweden. Table of new forwarder sales by weight class in Finkand and Sweden 2017. Weight class= loading capacity in metric tons. 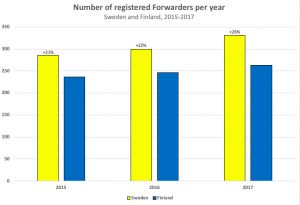 There are also more forwarders registered in Sweden with a capacity of around 18-20 tons. Especially in the north. This machine size doesn’t seem to be represented at all on the Finnish market. The most common forwarder in Finland in 2017 was the Ponsse Buffalo (50 of them registered), and the second most common was the Ponsse Elk (40 registered). In Sweden, the most common forwarders last year were the John Deere 1910 and 1510, with 34 machines registered each. 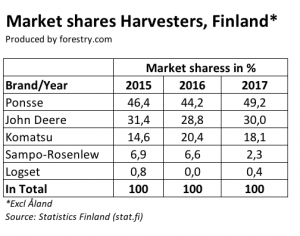 If you look at harvesters in Finland there are major similarities to the forwarder market in the sense that the largest harvesters, such as the Ponsse Bear, John Deere 1470 and Komatsu 951, are all absent. The smaller strip road harvesters, on the other hand, are quite common. The most common harvester in Finland in 2017 was the Ponsse Scorpion King (41 registered), closely followed by the John Deere 1270G (40 registered). If you calculate the average loading capacity of the forwarders sold in Finland in 2017 you’ll find that it’s 13.1 ton. The corresponding number in Sweden in 2017 was 14.8 ton. 1. The first question that appears is why there aren’t any larger forwarders or harvesters sold in Finland. For forwarders, the hauling distance should be the main deciding factor. A longer hauling distance = larger forwarders and more timber each turn. Are the hauling distances shorter in Finland? 2. Another contributing factor which might raise demand for larger machines is the terrain, for example steep hills. Is the terrain trickier in Sweden than in Finland? 3. 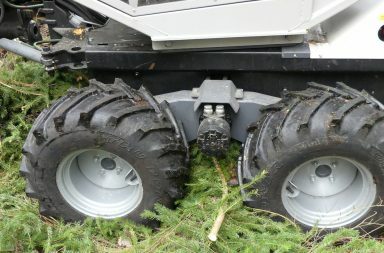 A reason to choose a harvester of the largest models should primarily be the forest terrain and possibly accessibility. The largest harvesters are all over Sweden but nowhere in Finland. How come? 4. Why are there so few of the smallest forwarders (such as the JD 810, Komatsu 835 or Ponsse Gazelle) in Finland? The sales of the smallest harvesters, such as the Komatsu 901 and Ponsse Beaver, have been quite good while forwarders of the 10-ton capacity are hardly used at all. 5. What’s it like for the smallest machines in Finland? For example Vimek, Malwa, Alstor, Kinetic, Bison, etc. Do they have a market in Finland at all or are they a Swedish phenomenon? There are probably a whole bunch of other interesting questions surrounding the statistics and machine markets of Finland and Sweden so please leave a comment about your opinion on this issue.